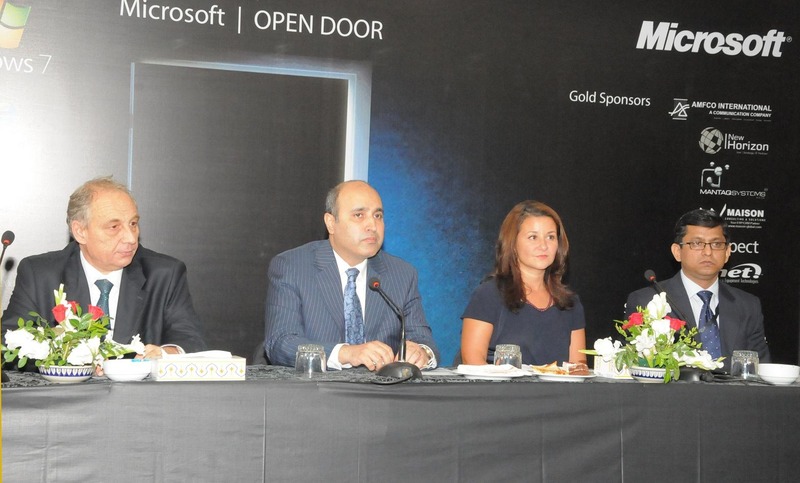 After the successful launch of MS Windows7, MS Office 2010 and Internet Explorer 9, Microsoft Pakistan kicked off with “Open Door” the biggest IT event of the year on Thursday November 4, at Karachi Sheraton. The 2-day event was attended by over 700 IT professionals and experts from all over the country. The event was an interactive and inspirational experience for hundreds of attendees. Microsoft, along with its business partners took the opportunity to showcase the latest innovations in the industry ranging from mobile solutions and business applications like Microsoft Communications Server, Microsoft Dynamics CRM / ERP and Microsoft SharePoint 2010. Microsoft and its partners also organized a series of live demos and presentations for experts and early adopters highlighting the company’s strategy, products and solutions for business and consumers. A panel of Industry Experts also participated in this event. They spoke on various IT subjects, specifically on how Microsoft products and solutions have changed our world today. The topics ranged from the future of productivity to the acceleration of growth due to technology. “The evolution in technology has now enabled IT products to become more purposeful and flexible, meeting the needs of the people as per how, where and when they work. Most professionals today want to instantly access and effectively manage their work at the office, at home, or on the go. IT professionals, in particular, are challenged to deliver business value to their companies while continuing to decrease their costs. In addition, businesses need to comply with new and increasing regulatory mandates and security protocols, while also focusing on driving efficiencies,” said Kamal Ahmed, Microsoft Country General Manager. “Partnering with Microsoft brings completeness to our vision, in assessing and realizing key business opportunities for our valued clients, through credible and broad range of technology solutions.” said Hashim Ali-CEO of Mantaq Systems (Pvt.) Ltd.
Microsoft is doing good job for the betterment of Social issues in Pakistan like they have recently donated millions of dollars for Flood victims. If you could tell about these kind of events before they take place, it would be great help, people can think of or can do attend these events that way.